Saturday January 6th at 12:00 p.m. 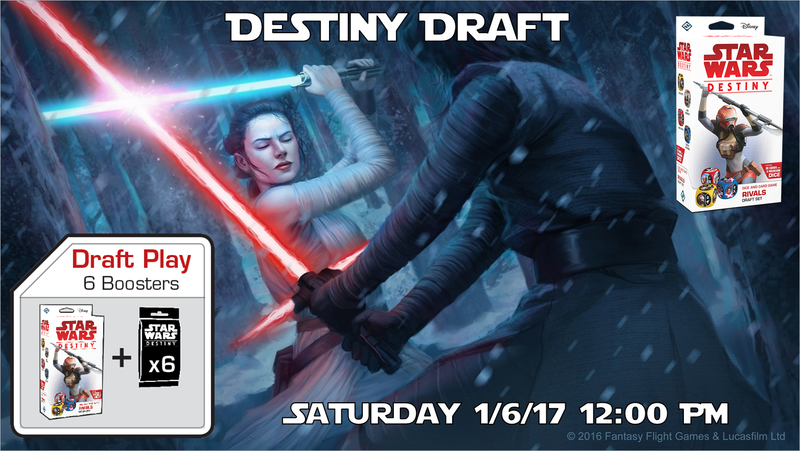 Draft Star Wars Destiny using the new highly sought-after Rivals Draft Pack. Players will receive 1 Rivals Draft Pack, plus 6 packs of Awakenings. Cost to draft is $30, which includes all product, plus prize support. Rivals Draft Packs are extremely limited and this event will be capped at six total players, on a first-come, first-served basis. Pre-registration is highly recommended to secure your spot. 3 Swiss rounds, 35 minutes, 1 game.